This has been a helluva week for those of us helping people without a place to live. There were plenty of tweets and Facebook posts about the heatwave, as well as the Border fire that was threatening several communities out in East County. But unlike the all-out effort to help residents, pets and livestock in the path of the fire, there was no effort to help the residents of downtown under direct assault from a relentless sun. Except for access to the library which, for those living on the street, would entail leaving all of your few meager possessions outside, unattended, there was no Health and Human Services program to help them. The week actually began last Friday for me when my friend Martha Sullivan called asking for help to provide a Cooling Station offering lifesaving hydration and shade for homeless people during the predicted heatwave. I had been focused on a different project when she called and tried to wheedle my way out of yet another humanitarian crisis. But, as anyone who has tried to turn down a plea for help from Martha knows, she doesn’t take no for an anwer. So I agreed to helping on Saturday and after a Father’s Day brunch with my dad on Sunday. The heat wave didn’t deter the green notices posted throughout the East Village over the weekend warning that unattended items would be disposed of in an “abatement” scheduled for Monday. 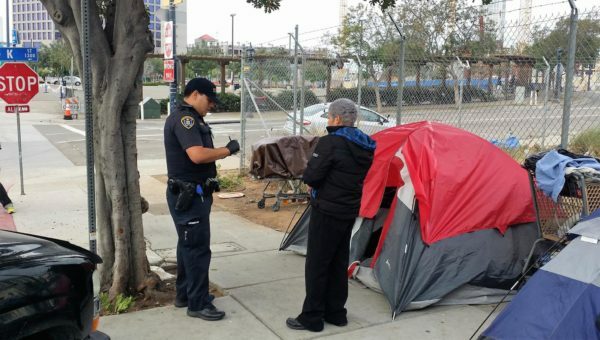 Ever since that heartless sweep on March 7 just prior to a major El Nino storm, the City has been targeting one or two blocks in the East Village each week to remove tents, and unattended belongings. Needless to say, folks are wary of leaving their stuff so they weren’t flocking to the library. It occurred to me that in a crisis, even livestock get shelter, but if people happen to be destitute, they just have to deal with it. Then there came a call from one of our Amikas volunteers who was out collecting information about the different organizations who are bringing food to homeless people with the intention of developing a phone application called FindMyFood. The idea is to help organize food distribution so people can find it, and so those distributing meals can coordinate to ensure that different areas are getting food every day. But one of the volunteers for an organization that serves food every Monday and Wednesday on 16th Street and Island had told her that they had been warned to stop distributing food in July because of the All Star Game. I couldn’t believe it. First there was the human-deterrent rockscaping, then the weekly sweeps, and now they were stopping food distribution — all to sweep our dirty little secret under the rug that San Diego doesn’t care for our homeless folks when company comes a calling. The weekend came, and Martha, along with Lori Saldaña, had organized the Cooling Station under the shade of the wisteria pergola at Tailgate Park. After doing the first part of a walk through of the site where the new Day Center should be relocated sometime this Fall (although it doesn’t look like anything has even started), I walked over to the Cooling Station just in time to help set up. We put folding chairs out so people could sit in the shade. One lady told me, as she settled into a chair with a long sigh, that they are not permitted to sit anywhere without getting ticketed for encroachment. The dozen or so chairs were steadily occupied throughout the day, with some very philosophical conversations going on. We unloaded chests of ice and jugs of water from Martha’s van and we were “in business”. It was such a simple thing to do – put together in a day, with donations and volunteers (and Martha’s event organization experience). Why couldn’t the city do this? I helped hand out hundreds of cups of ice water, bandannas soaked in cold water, snack bars, and refillable water bottles filled with ice. Some of the hands reaching out for these things were very dirty; some were remarkably groomed; one man had just cut his finger and one of those bandannas served as an emergency bandage. Some of the arms reaching out to us were thin and weathered, and some were so very young. I looked into eyes that were teary with gratitude, though some were pools of hopelessness and others were so lost. One lady rambled on and on, and I couldn’t understand a word she said. So many people blessed me that if I had died, I would have surely floated straight to heaven – all for a cup of cold water. Monday morning I heard that the sweeps were in full force and people were being packed into Neil Good Day Center. I went down there with a friend to see what was going on. Both sides of 17th Street were a solid line of shopping carts covered with blue tarps, and people standing about looking disorientated. Neil Good Day Center was full, but not as bad as I had expected. The manager, Dennis, told me it had been much worse earlier, but people seemed to move on. Where? He didn’t know. While chatting with Dennis about the showers that are now at St. Vincent’s, he pointed out that because they are group showers, like those back in school lockers, there is no place for kids to shower. Moms or Dads can’t take their children into showers with other naked adults. We wondered how homeless parents can bathe their children. I certainly saw plenty of them the past weekend – homeless children. Later that day, I attended a rally at an apartment complex in Linda Vista near where I live. Two families who had filed grievances about deplorable living conditions, including mold, and rent increases of $500, had been evicted. Even though it is illegal to retaliate against tenants who ask for repairs, slumlord Michael Conteras thought he could take advantage of these tenants. While there was a very vocal coalition of tenants there with signs and chants and a few activists making speeches, the media was a no-show – except for me. Not a single story – just two more families facing homelessness. Because affordable housing is so scarce, most will continue to live with the mold and disrepair and find some way to pay the increased rent, until they can’t, and then they too will be on the streets. That seems to be the way of it. No affordable housing. Plenty of promises. A city that cares more about showing off for a baseball game than where kids can take a shower, or old ladies can sit down out of the sun or hundreds of people can get a meal. Any society that disregards the needs of the poor, is tottering at the precipice of failure. Remember when Marie Antoinette was informed that the people had no bread? When she suggested they eat cake, she wasn’t being oblivious to reality, she was being mean – she was referring to the burnt crust that remains in the bread pan after you pop out the fresh baked bread. In the end, it didn’t turn out so great for Marie. Thanks Jeeni. Your long-time activism on this issue is inspiring. Your suggestions helped Martha and me when we began investigating and planning the pop-up cooling station last weekend. We issued a media announcement before doing this action- counting on more attention to both educate people and attract support, including donations of water, ice and money to pay for supplies. The daily presence of cameras may have also helped insulate us from SDPD harassment. I’d like to think we are approaching a “tipping point” in San Diego where people (and the media) cannot ignore the severity of the affordable housing and homelessness problem, nor the callousness of the Mayor’s policies. Lives are at stake. Displacing people in the rain and cold of winter and heat of summer is potentially deadly. It may be encouraging others to act our against people in violent and deadly ways. And clearly, this humanitarian crisis cannot be solved with the “traditional” solutions that have been employed for years. A more direct approach is required. You are all heroes. This is what San Diego is about. Not sports, comics or a tourist’s sensibilities. Fix the problem or continue to be shamed by these and more women who will come to help. We are talking to you, Faulconer. Jenni, thank you for your dedication to helping and bringing awareness to life’s challenges that are facing many homeless, seniors, and others. We are all in this life together. Why can’t there be more compassion for our brother. Jenni, you are a true Saint A true hero. Find out who is responsible for/in ‘charge’ of that NATIONAL list of mayor’s and other high-ranking city officials that have signed on (what? 2-3 YEARS ago now) to RESOLVE homelessness! In a rock garden, it is nothing more than the whining and sniveling of the businesses that are too heartless to help, a general sweeping under the rug or the fastest road outta town, and the over-glorification of people and places like Father Joe and VVSD….Both of which are MONUMENTAL FAILURES in their own programs…”revolving door” ring a bell? I say it’s time to hold this WEAK mayor’s feet to the fire and find out how to hold him to accountability through that National list he put his signature to. He made me fear for my life during the Filner coup…ran into him at Smart and Final in Sports Arena and in a very brief and curt conversation he told me to my Disabled Veteran homeless face that he could Not care less about the homeless. …well, DUH, that’s been obvious his entire tenure. Ouch. And it’s for sure Faulconer didn’t feel anything. Perhaps those of the present day might be dubbed “Faulconer-villes” (or some other such derivation)? Monumental Failures!? I take great offense to your opinion of FJV and VVSD. I work for FJV and work side-by-side with compassionate and loving people everyday! I see miracles everyday working in people’s lives. When staff and client take a ‘whatever-it-takes’ approach the case plan .. I have seen people elevate out of the ‘revolving door’. It takes acceptance and honesty on all levels. Every person’s story and path is different .. and even if ONE person’s life is changed by going through the program.. then it’s a success! Thanks, Jeeni, for your elucidating article. Pop-up cooling stations should be a regular occurrence this summer. If we could recruit enough volunteers and train them, we could do it on a spontaneous basis. It doesn’t always have to be in the same location. A pop-up canopy/gazebo can be bought at Wal-Mart for around $50. Cold water is pretty cheap. A friend of mine distributes water and Vienna sausage at a park in Tuscon. I like the idea of stealth, guerilla pop-up stations. What do you think? Water is inexpensive- we had many people donate bottles. We did add ice in insulated dispensers and served people in paper cups- we did not want to use single use plastic bottles. The ice required ice chests- we had several. It’s very helpful to cool people who are often warm from wearing extra clothes and standing/walking on hot concrete/asphalt. The chairs were also essential to allow them a place to sit and relax while drinking the water. We also gave out snacks: bananas, apples, oranges, granola bars. Also bandanas that people could soak in water and use to cool off and shade their heads. Hope that helps to give an idea of what’s useful for this, if you want to organize something similar this summer. And I encourage you do to so. There are lots of very heat-stressed people out there. Forgot to to mention: pack some first aid supplies. We distributed bandages, applied topical antibiotics, and set out hand sanitizers and “baby wipes” for people to clean up minor injuries. In retrospect, basic soap and water would also be a good idea, with paper towels to dry off. Many of the people we encountered had injuries on their hands that were becoming infected since they lack access to running water much of the time, and have trouble keeping their hands clean. The infections are from uncovered abrasions, lacerations etc. on their hands, the result of constant use: setting up/taking down tents, pushing shopping carts and baby strollers, and/or searching for recyclable materials amidst garbage. So if you choose to do a cooling station- please remember to bring first aid supplies also- thank you! Thank you Jeeni for continuing to bring this issue to the public view. And thank you Martha Sullivan and Lori Saldana for all that you do. I notice that your Facebook share button on all SDFP articles no longer works. The only way I can share the article is by copying the article link/address and pasting it into a Facebook post. SDFP needs widespread circulation because of the excellent and compassionate work of all the contributing writers, and because they expose the the city’s dirty business (like that which is pointed out in this article) and which the other media ignore. One way to increase circulation is to include a direct Facebook share button. I hope the problem will be corrected ASAP. Hi Wayne. We’re working on what is amiss. Thanks for your readership. Hi Wayne, I have added a FB share button in addition to the FB Like button. Please let me know if you can see the buttons. Please add a Twitter button for each article. The twitter button is available when you open the article. It is at the top. FB is also an option. I’d be happy to help be a part of the solution . Let me know how I can help out, you’ve got my email.